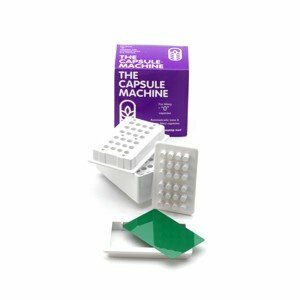 The Capsule Machine - fills cap size 0 - 24 capsules in less than 2 minutes and automatically joins and ejects the filled capsules. Includes tampering tool, desiccant bag, and instructions. The advantage of making and filling you own capsules is being able to make your own custom mixes with your own ingredients, and you can avoid the use of binders and fillers. Perfect to use with our empty vegetarian or gelatin capsules. See our extensive variety of herbs and spices for quality ingredients to use in your capsules.